Ferrovial Agroman will build the high tension electricity grid to supply the ITER complex in France for 30 million euro. The company has six years to complete this project. The ITER project is the world's largest experimental facility designed to research the viability of fusion power. This is Ferrovial Agroman's fourth contract as part of this project: it is already participating in the construction of the Tokamak reactor building and various ancillary buildings. Ferrovial Agroman, Ferrovial's construction subsidiary, has been chosen by Fusion for Energy (F4E), the European Union organisation that manages Europe's contribution to the ITER, to design and build the complex's high-voltage electricity grid, in Cadarache, southern France. The contract is worth 30 million euro and Ferrovial Agroman has six years to complete the project. The 1,200 MV grid will have two substations comprising a total of seven transformers. It will provide the energy needed to heat the plasma in the reactor and to supply the cryogenic and cooling systems and other infrastructure. Ferrovial Agroman will also execute civil engineering works in connection with the buildings and areas where electric devices are located. This is Ferrovial Agroman's fourth contract as part of the ITER project. In January 2013, it was chosen to build the Tokamak reactor building in consortium with Vinci and Razel-Bec. In 2014, it was awarded two contracts: to build two buildings for the conversion of magnetic energy, and to build the cooling towers and hot and cold basins. The ITER project is a first-of-a-kind global collaboration in the field of energy. It will be the world's largest experimental fusion facility and is designed to demonstrate the scientific and technological feasibility of fusion power. Fusion research is aimed at developing a safe, limitless and environmentally-responsible energy source. Europe will contribute almost half of the costs of the construction, while the other six members of this joint international venture (China, Japan, India, the Republic of Korea, Russia and the US) will contribute the remainder in equal parts. Fusion for Energy (F4E) is the European Union organization managing Europe’s contribution to ITER. One of the main tasks of F4E is to work together with European industry, SMEs and research organizations to develop and provide a wide range of high technology components together with engineering, maintenance and support services for the ITER project. 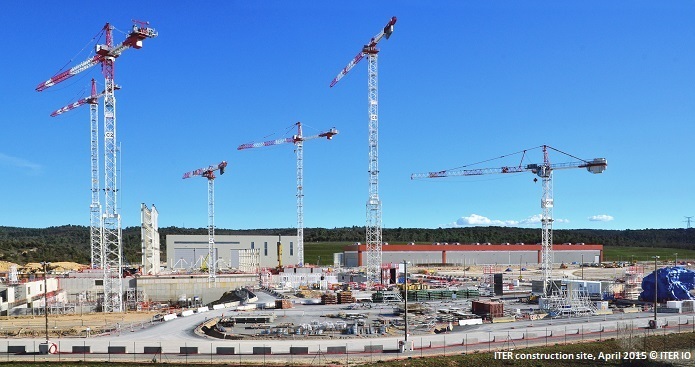 ITER is the result of international collaboration of unprecedented proportions. It will be the world's largest experimental fusion facility and is designed to demonstrate the scientific and technological feasibility of fusion power. Fusion is the process which powers the sun and the stars. When light atomic nuclei fuse together to form heavier ones, a large amount of energy is released. Fusion research is aimed at developing a safe, limitless and environmentally-responsible energy source. Europe will contribute almost half of the costs of its construction, while the other six members of this international joint venture (China, India, Japan, the Republic of Korea, Russia and the US) will contribute the remainder in equal parts. The ITER project is sited at Cadarache in the south of France.